Is it not refreshing that Tiger Woods' career has crashed and burned so dramatically? http://www.JewishWorldReview.com | Along with athletic prowess and screen presence, forgiveness is rapidly becoming a marketable commodity. Before much longer, the rich and famous may find themselves advised by their agents to commit acts of moral turpitude in order to schedule press conferences seeking public absolution. Sexual indiscretion has become so much a part of our society that many wonder why the latest scandal surrounding Tiger Woods has generated more than a passing interest. After all, the peccadillos of former President Clinton, former vice-presidential candidate John Edwards, and former New York governor Elliot Spitzer  among many, many others  should have left us jaded to the culture of infidelity in which we live. 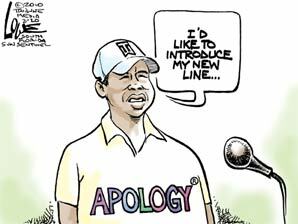 We may find refreshing, therefore, that Tiger Woods' career has crashed and burned so dramatically. Apparently, many Americans still care about morality. Ironically, the scandals not only continue but increase in frequency and magnitude. Given that fame and power seem the common-denominators in a litany of ruined families and careers, should we not expect that the powerful and the famous might learn from the failures of their predecessors? Assuming that an average amount of intelligence is required to attain public prominance, why are so few apparently able to avoid repeating the mistakes of others? Perhaps the answer can be found by turning the clock back two and a half centuries. According to Jewish tradition, Rabbi Israel Ba'al Shem Tov, founder of the Chassidic movement, reported that before his birth, his soul was paired with another pure and righteous soul with whom he studied the secrets of Torah wisdom prior to being sent forth into the physical world. After birth, his pre-natal learning partner was blessed with anonymity, whereas he, the Ba'al Shem Tov, was "condemned to fame." Few people today would consider anonymity a blessing or fame a curse. Then again, many celebrities do recognize the curse of fame, even if they continue to pursue it as a drug addict pursues his next fix. Notoriety carries with it the public scrutiny of every word and action and the loss of a private life  a steep price to pay for the superficial rewards of fame. How much better to live a quiet existence and enjoy the genuine rewards of family, community, and a life lived well. Jewish philosophy therefore stresses the importance of modesty. Commonly misunderstood as a precept applying to women's clothing with the intent of preventing sexual arousal in men, the Jewish concept of modesty is in truth a code of personal conduct designed to preserve personal privacy. In truth, the concept of modesty applies to both men and women, and it extends to all manner of public and private behavior far beyond either attire or sexuality. The popular cliche "don't judge a book by its cover" accurately reflects the spirit of Jewish modesty. In our physical world, outward appearance often belies inner nature. To admire a great book for its cover is to miss its greatness entirely. Similarly, by valuing only the blandishments of material existence, by pursing the transient pleasure of physical indulgence at the expense of genuine relationships, we find ourselves relentlessly seeking a satisfaction that perpetually eludes us. By coveting the egoistic gratification of public adulation at the cost of inner meaning, we leave ourselves with only the most two-dimensional and unfulfilling rewards of a life half-lived. The acceleration of technology has rendered us far more vulnerable to the curse of superficiality. The so-called information age has created the illusion that we are well-informed, when in fact we are so inundated by headlines that we rarely plumb the depth of any single story. Instant access to everything has left us impatient and unwilling to exert the effort to acquire anything that requires time and discipline. We don't want to work for what is truly valuable, so we value only that which demands little work. At the same time, we can't escape the awareness that something profoundly important has been lost. And so we are no longer surprised when our heroes fail us. Beneath the surface, we don't expect anything more from them. Despite the virtue of forgiveness, however, our reluctance to forgive may be the most revealing symptom that there remains some small hope for our society. With privilege comes responsibility, and we feel passionately that those who shirk responsibility deserve to forfeit their privileges. Perhaps enough such incidents will finally produce a much needed paradigm shift, returning us to our senses so that we reject the fantasy world of celebrity and the allure of power. A life of modesty focuses our attention on the rewards that come with a rich inner life of enduring values and true purpose, a life all the richer for its privacy, its quiet dignity, and the contentment that, once lost, can never be recaptured by making public apologies for having abused the narcotics of power and fame.